The flag depicts the traditional dragon emblem of Somerset, a design first promoted as the county flag by Ed Woods in 2006. The red dragon has been used for the last century by the local county council as their coat of arms but it is ultimately derived from the banners borne by Alfred the Great and his kinsmen during the era of the Viking Wars, which were variously described as bearing red or gold dragons or wyverns. Further research suggests a potential linkage with the county that reaches further back to Celtic use of a dragon symbol itself ultimately derived from use of the Draco symbol by the Roman military during the Roman occupation of Britain. In essence therefore, the flag is a traditional design with a pedigree of over a thousand years. In 2013 the design was submitted to a county flag competition which it duly won. The flag is promoted at http://www.facebook.com/SomersetFlag which features much discussion of the provenance of this design. Wessex keeps popping up. Apparently, in Somerset and Wiltshire at least, the symbol is a "dragon" and not a "wyvern". A wyvern would make more sense because the red dragon is very definitely the symbol of Wales. 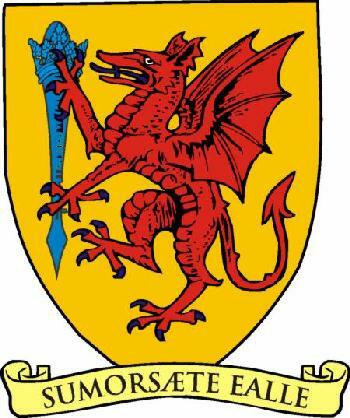 The arms of Somerset I include and the motto "Sumorsaete Ealle" means "All the people of Somerset" and is a quote from the Anglo-Saxon Chronicle in 870 when Somerset was first mentioned historically. The arms were granted in 1911 and to make the arms distinctive the "dragon" supports a civil mace to show that it is the arms of a local council and not that of Wessex. The creature is a dragon both in the flag and the coat of arms. A Griffin has an eagle's head, whilst a wyvern only has two legs and a fish's tail. The flag shows a red dragon. It is being used a lot in the county of Somerset (southwestern England). It is popular with trade fairs, local parishes & cricket clubs. It has a long heritage as it is represented on the coat of arms and flown in most council buildings. "A Langport man has launched a campaign to try and create a united flag for the whole of Somerset. Ed Woods has set up the website www.somersetflag.com to try and get a flag recognised for the county. He wants to use the red dragon from the Somerset County Council flag, but without the mace, which is legal property of the council. Mr. Woods said: "I think a flag is of great interest in this county though as we are still divided up into three parts, so what was needed was a symbol to unite the country from Porlock to Portishead. "I think that a lot of people are unaware that Bath and North East Somerset and North Somerset are part of the county of Somerset, imagining them to be separate counties of a sort. "Although not a part of the administrative county, they are still very much part of the historic and ceremonial county. "The flag campaign puts much emphasis on this and seeks to foster a spirit of unity in the entire county, even if it remains divided." Anyone wanting more information on Mr Wood's campaign should visit his website". "For several years after the creation of Somerset County Council in 1889 they had no official coat of arms. In 1906 the council unofficially adopted a variation of the Wessex wyvern, in this instance it became a four legged dragon, as their crest. The dragon was golden on a red background, just as the old wyvern of the Saxon Kingdom of Wessex had been. When Somerset County Council finally applied to the College of Heralds in 1911 for an official coat of arms, it became a red dragon on a gold background holding a mace as a symbol of office. They became the official arms of the Council on the 2nd December 1911. The motto Sumorsaete Ealle means "All the people of Somerset" and is a line from the Anglo-Saxon Chronicle of 878 when they rose up under King Alfred the Great to liberate Wessex from the Danes. A modified version of the arms was adopted by the Council in 2004. Dragons have been associated with Somerset for many centuries, with their adoption as standards by the Saxons, Romans and Celts alike. The stories about them are legion. The West Saxons were using a golden dragon standard by the mid 8th century and it was carried into battle against the Mercians in 752 and the Danes in 1016. Its final use in battle was at the Battle of Hastings in 1066, by which time Wessex had long since become a part of England. There is a difference between a dragon and a wyvern. 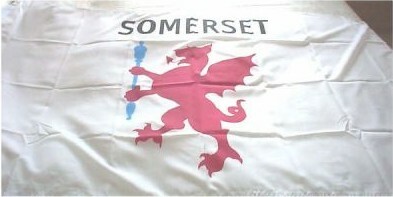 A dragon is the creature on the Somerset flag, having four legs. A wyvern on the other hand has only two legs. The Somerset flag does not have a wyvern on it, despite it often being called that." "A few suggestions as to possible official usage of the flag have been made. Doug Bailey has proposed that the flag should be flown in Taunton on St Botolph's Day, 17th June, and for a fair to be held on that day as there were up until the early 1900's. There is also St. Dunstan, a Somerset man and the nearest thing we have to a patron saint, who's feast day is on the 19th May. The various towns and villages around Somerset could fly the flag on the feast day of the saints that their local churches are dedicated to, perhaps holding their own fairs. I think St. George's Day should be reserved for the national flag however. That is perhaps a throwback to the Middle Ages, but it would mean that there could be an even spread of fairs around the county all year round. If that seems too religiously based, perhaps the flag could be flown during the Carnival Season or at other traditional even." There is a message board on the BBC's website for Somerset at www.bbc.co.uk/dna/england/F2770282?thread=3304482&skip=0&show=20 which seems to show that progress on this is happening slowly, if at all. One point which I find interesting is that many of the participants relate the campaign for a Somerset flag to the successful flags for Cornwall and Devon - Devon being immediately to the west of Somerset and Cornwall west of Devon. I remarked when a campaign for a flag for Lincolnshire was started and reported on the List that it was tempting to see local county flags in England spreading from the south-west and the north-east as adjacent counties emulated the flags they saw 'over the border', the north-eastern origin, of course, being the traditional Northumberland flag and the Yorkshire flag to its south. Ed Woods' site at www.somersetflag.com/main.html included a video clip of him being interviewed on 'BBC Points West', the local news programme for this part of the world. This contains two 'real' flags, one the official flag of the current Somerset County Council, which is a coat of arms on a white cloth. This flag is typical of many local authority flags in England (and possibly in the U.K.): it exists, it is flown, but it is flown only in one place - County Hall, Taunton, in this case - by one 'person' - the local authority - and it isn't necessarily flown every day. It has no general use. There are similar types of flag for Bristol and for Birmingham (though these are rather more attractive Banners of Arms) and no doubt there are many other examples. The other flag referred to and shown in the video clip is no longer used. When the map of local authorities was redrawn in 1974, the new County of Avon was invented to take in Bristol and parts of the surrounding countryside which had hitherto been in southern Gloucestershire and northern Somerset. A Bristol man was in the habit of flying a black flag from his house on the anniversary of the new County of Avon to mourn the loss of Bristol's 'independence'. He died some years ago and this 'ceremony' no longer happens. In any case, local authorities were reorganised again, and Avon is no more.